In this blues guitar lesson sample video, now available on YouTube.com, Jacques Darville teaches how to play a Dominant 7th scale for blues guitar. This scale is awesome to use when you are playing the blues. A Dominant 7th chord or arpeggio is composed of the root, major third, perfect fifth and the minor seventh (flat seventh) notes of the major scale. Its function is to resolve to the tonic note or chord. “This scale is awesome to use when you are playing the blues,” says Darville, “because when you play blues you are going to play 7th chords.” Jacques explains that when you play the Dominant 7th Scale you are going to play a Major Scale with the minor 7th from the minor scale. Jacques demonstrates how to play this in the key of A as follows; 5th fret of the 6th string with 2nd finger to the 7th fret with 4th finger, 4th fret of the 5th string with first finger to 5th fret with 2nd finger to 7th fret with 4th finger, 4th fret of the 4th string with first finger to 5th fret with 2nd finger (this is the minor 7th or flat 7th) to 7th fret with 4th finger. “This is tailor made for the 7th chord,” says Darville. Jacques continues this easy beginner blues guitar lesson by demonstrating combining the Blues Scale with the Dominant 7th Scale to create some really nice sounding blues riffs that work great with 7th Chords. Guitar TAB’s are available for this easy blues guitar lesson at BluesGuitar.com. Jacques Darville is Danish born American who specializes in both acoustic and electric blues. 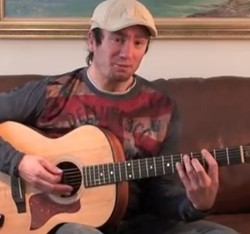 Jacques has taught guitar and music for over 16 years. He is a graduate of Oakland University in Detroit Michigan where he earned his B.A. in music/performing arts. Jacques currently resides in Copenhagen Denmark where he teaches guitar to students of all ages, and actively plays with his band, Darville Duo. In addition to having a great deal of recording experience, Jacques has also toured in the USA, Denmark, Holland, Austria and the Philippines, both as a solo artist and with different bands. BluesGuitar.com is the leader in modern blues guitar instruction. It’s packed with resources including articles, video lessons, and the best videos in the business for the beginner to the advanced guitar student taught by the best instructors out there.